In the last couple of months Darren has been updating the blog with summer birding manly during ringing operations here in Sde Boker. While He was jollying here I was busy running Birding Camps for children and preparing for some of the future activities. Trying to set up a Birding Center can be a little demanding and can mean not as much time as one wishes in the field. Lucky for me, one of the tasks we set for this year was to study the current distribution of the Sooty Falcon, Falco concolor, one of the Negev specialties. So that means back to the field! In order to do that, we decided to look back at previous breeding surveys. With the help of the IOC (Israel Ornithological Center) and NPA (Nature and Parks Authorities) we got hold of history breeding data and soon realized that information was pretty much undecided. Until the late 70's the Sooty Falcon was treated as a rare breeder in The Judean Desert and Eilat. A first survey showed that the species is more common than thought and a raptor survey conducted in 1980-84 suggested a population size of 70-100 pairs all over the deserts of Israel . But indication were made that lots of potential sites haven't been checked. Since then local counts have been conducted but no general population estimations have been done. 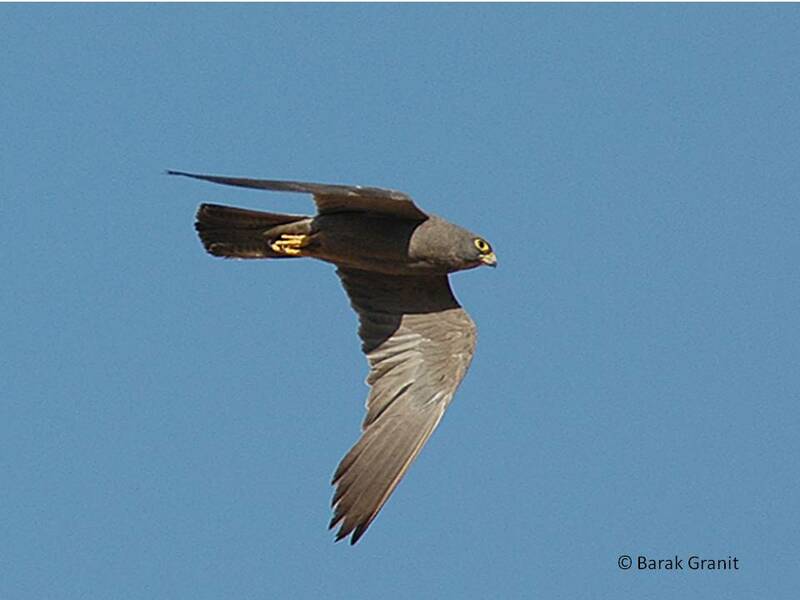 The Sooty Falcon arrives back from his wintering grounds in Madagascar and southern Africa in April-May. It raises the chicks in autumn, timing it exactly to the peak of the bird migration (August-October). A study on some of the pairs breeding near Sde Boker showed that 95% of its diet is based on migratory birds. By late October all the birds have gone their way back to Africa. We divided the Negev to different geographic areas and marked all the historical known nests in each and every one of them. Looking at the nests distribution we decided to focus on two areas which consisted most of the breeding sites even though some of them haven't been studied therally; the Cliffs of Zin River and the area east of Ramon Crater. These areas are vast, containing huge cliffs, all potential breeding sites for the Sooty Falcon. The way to do it, we learned, was to spend as much time as possible in the area, no short- cuts! After two weeks of working the Zin Cliffs, covering most of the cliffs we found four definite breeding sites and three potential ones. We've decided to return to this area later when the chicks will be older and noisier, hence easier to spot. Encouraged by these results we set for our very big challenge; East of the Ramon Area. While the Zin Cliffs are pretty easy to reach by a normal private car, the Ramon-East area is very remote and can be reached only by 4X4b vehicles. If we want to find the birds we need to spend time there, mainly mornings and evening which means camping for at least two nights… Life is hard. So off we went! Barak and I were joined by Tomer from Hazeva Field School and Yael. Scanning in the evenings and hiking during the days, especially mornings (day temperatures exceed the 40c°), we found at least 3 pairs with a potential fourth. On the second day during our lunch break a pair of Sooties was air-displaying along with an immature bird (probably 2nd yr) above our heads, so close we could actually hear the wwwooosshhh as they cut through the hot air. After that they sat 20m above our heads and cleaned themselves, beautiful!! We couldn't help but wonder if this second year bird has migrated all the way from southern Africa or stayed here after fledging last year, interesting. Camping in this stunning part of the country was absolutely a pleasure. Barak learned the secrets of the pojke and we all learned a thing or two about the gorgeous Sooties and how to find them. Apart from them we had a nice wildlife list; Sinai Agama Agama sinaita, Ibex, Hyrax, Golden Spiny Mouse, Brown Hare, Sinai Rosefinch, two pairs of Egyptian Vultures and about 300 White Storks. This survey is still ongoing and we have plenty of work ahead of us. I'll keep updating about our progress here in our blog . I want to thank NPA's Ben and Yoram for logistic support. I am a ringer fron spain and i would go to ringing with your, during autunn,one o two weeks, will be that possible. my e mail is lutra24@hotmail.com.